Have you wanted to learn baby signing but just don’t know where to start? Worried that you might do it “wrong”? Or started, but gave up because you didn’t think that you were doing it “right”? The beauty of baby signing is that once you know how, it really is quite easy. You can learn as many or as few signs as you like or feel that you need. And once you know how to learn baby signing, the sky’s the limit! To learn baby signing, the first step is to choose a few starter signs. The jury is out on the exact, perfect, ideal number of signs to start with. There is no exact science, sorry! Choosing just a couple of signs has worked for us with our children, but that’s not to say it is the right thing for someone else. From my experience, the hardest part is making signing part of your day to day routine, so that it doesn’t become another chore. For that reason, I recommend choosing a couple of signs that you know you can use regularly during each day. Consistency and repetition are essential to your baby learning signing, so signs that you know you will actually use many times during the day make it so much easier. If you start with too many signs you could become overwhelmed with the pressure of trying to not only remember the signs, but also remember to actually use the signs at every opportunity. Some great signs to start with are MILK and EAT because there will be many opportunities during each day to use the signs. 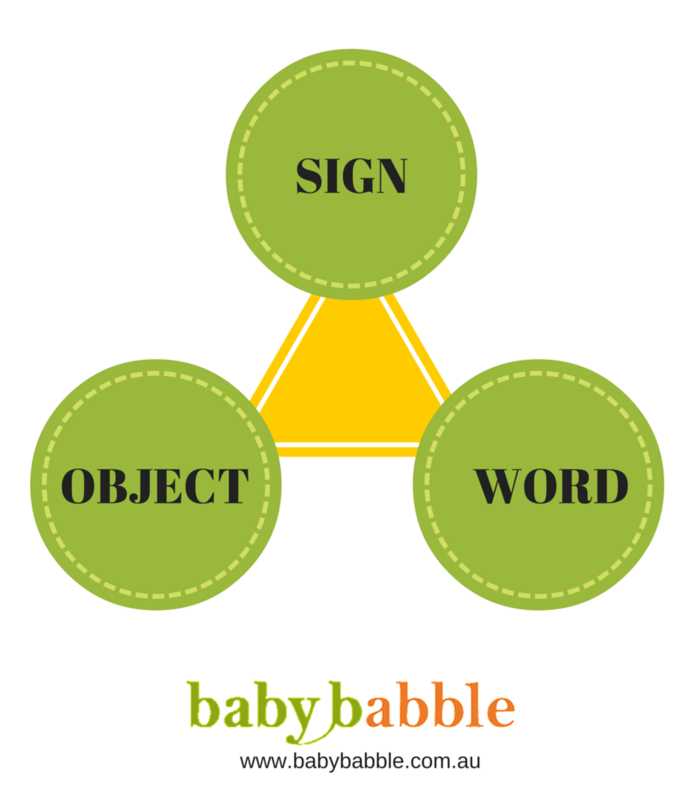 It is important to remember that to teach your baby a sign, they need to make the connection between the word, the sign and the object. Therefore, you don’t just sign MILK when you are feeding the baby their milk. You need to say the word, ideally in a conversational way (“Bubba, is it time for your MILK? Are you ready for your MILK? Mmmm, yummy MILK for you!”). Yes, it can sound a bit silly to you at first, but in no time it becomes habit. When you say the word MILK, also make the sign and ensure the object can be seen by the baby. Context is important to enable the baby to make the connection between the three elements. Remember – Consistency, Repetition and Context. If you would like to get a copy of the Baby Babble Starter Signs, make sure you subscribe to updates – including tips, videos and earlybird access to the Baby Babble online course to be launched in 2017. Subscribe to Baby Babble updates to receive tips, videos and a copy of the free Starter Signs PDF. We promise not to spam you! You will also get access to earlybird rates for the Baby Babble online course to be launched in 2016. Subscribe to get your free starter signs. Spam is for jerks. We promise to not spam you.